I got a mobile with Champagne Grey color , the Phone looks very trendy and great while holding , It has Lock + Power Key on Right hand Side and Volume Rocker on Left Hand Side , which are well positioned to suit the User needs , It have Headphone Jack at the Top and Data Cable at the Bottom , Lower buldge on the Phone may make it ugly for some People . Unlike , other micromax Android Phone in this range like Micromax A56 Ninja 3 , this phone does not feature Textured Back Panel , which make it little slippery to hold , but good news is that this time Back Panel is made up of Durable and Good Quality Plastic. Micromax is powered by 1 GHz Qualcomm Scorpion MSM7225AA CPU with 256 MB of RAM and 512 MB of ROM , with GPSone GPS , 2.1 +EDR Bluetooth and Wifi with Hotspot Facility. The phone is bad combination of Powerful CPU and low RAM which allow a User to use only 50 to 70 MB of RAM , due to which you'll afraid to use apps like Facebook and Whatsapp which continuously consumes 20 MB of RAM, Apart from this you cannot play heavy games like Temple Run etc. Motion Sensor of this Phone is either Misconfigured or only support 2D tilting , means your phone will not react on Diagonal Tilt and you will not able to play all Motion Sensor based Games. Display is the only only Plus point in this phone with 3.5 Inches Big Display supporting HVGA Resolution you can have pleasure to read Ebooks , Surf online , Watch movies and Youtube Videos. 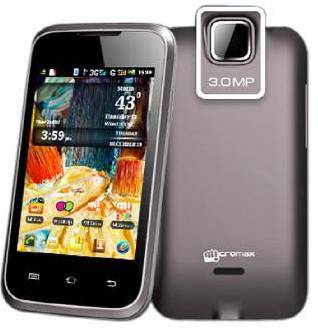 With 1 GHz CPU Display is more responsive than Galaxy Ace, with Viewing Angle better than all other phones in this Price Range. It also have 3 Capacitive buttons which are handy to use, only drawback is there is no Backlight on Buttons, due o which you cant use them in Dark. Micromax A54 features Android 2.3.5 Gingerbread which comes with mLabs Launcher (micromax launcher) which too consumes 8-9 Mb of RAM , Appart from Setting Menu there is no customization on this Phone. This Phone comes with Hookup, Mistore, miweather, milive, which are still under construction and don't work properly . Hookup is handy feature but due to less popularity , you'll find friends rarely on Hookup, and it's too consumes 12 MB of RAM . The Phone also consist The DarkMan and Tetris Trial version Games which you can play only 2 times and then have o pay rs 55 to get full version , they keep acting as Bloatware. Micromax A54 comes with 1300 mAh Li-ion Battery which is too low for a phone with such a great and power-Consuming Hardware. On Wifi and normal activities like using GPS , Music , surfing it gives battery backup for 1 and half Day with Talktime of 4 hrs. But if you use Phone on "Data Connection" , battery will drain out 4 time faster. Micromax A54 Camera is bit noisy in the Dark , but can click great Pictures in Proper Daylight. I recommend using apps like Camera FV , as it will add Auto Focus, Macro and ISO setting in Camera.